When captured by the Nazi's, Sarah finds herself in a concentration camp that not only brings her closer to death...but closer to love. Sarah Brenner, a young Jewish woman, is terrified when she finds herself in the heat of a railcar bound for a work camp in Nazi Germany. For years she, along with her mother and sister, had hidden from the SS, but no one could hide forever. Her hatred for those who have enslaved them is ever-growing, especially when they arrive and she encounters the shockingly handsome Nazi doctor who can’t seem to keep his eyes—or hands—off her. This is a short story that packs a lot of emotion in a few pages. It begins in July 1945, right before the Allied occupation. I have to admit I cringed initially at the idea of a Nazi soldier being the hero of the story paired with a Jewish heroine. Aurel Rothstein was the head doctor at the camp, which made me even more nervous. Sarah is beautiful but she's no shrinking violet and is destined for trouble once she reaches the camp. She and Aurel have an immediate connection at first sight and both take incredible risks. It's a haunting story, complete with the reality of the horrors of the concentration camps as a backdrop for a touching romance. By the end, Aurel emerged as a more honorable man than I believed but no excuses were made for his contribution to the Nazi effort. He's not quite an Oskar Schindler but nor is he a Josef Mengele. Sarah is his redemption and he's her future. Martin has written a provocative story that serves as an excellent discussion about redemption, forgiveness and the blindness of love. I'm still thinking about it. 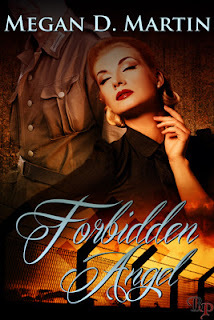 Thanks for taking a chance and reading Forbidden Angel. I am so pleased that you liked it! I really did, Megan. Nicely done.